These cookies really are the best ever oatmeal chocolate chip cookies! The recipe has been asked for over and over again. It’s an amazing recipe that is always a hit. I make other types of cookies and my family says they are good, but asks why I didn’t make oatmeal chocolate chip. They are that good. I make my own homemade vanilla extract. It adds extra delicious flavor. If you’ve never made your own Vanilla extract you can find the recipe HERE or you can buy some from my shop HERE. Since we don’t eat a lot of sugar, I take the amount of white sugar down to a 1/2 cup. If you’re looking for a standard cookie sweetness you’ll want to keep it at 1 cup. For a “breakfast cookie” I’ve made them with only the brown sugar and my kids still ate them up. They are more like muffins. The chocolate chips add enough sweetness. 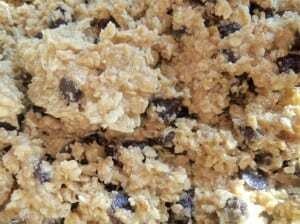 Combine in a large mixing bowl the butter, applesauce, sugars, eggs, and vanilla extract. In a separate bowl, combine the flour, baking soda, baking powder, salt, oats, chocolate chips, grated chocolate bar and nuts (if adding). Combine ingredients of both bowls until mixed thoroughly. Spoon onto cookie sheet 2 inches apart. Bake for 8 minutes. They should just be beginning to brown. This will keep them soft and gooey. Bake longer for a harder, crunchier cookie. I hardly ever have a chocolate bar lying around to use (they never last that long), so I don't use that, but it is really good if you have one. Also, if you want a crispier, more buttery cookie you can omit the apple sauce and add another ½ cup butter. My family loves the apple sauce version which is more chewy than crispy. I like to take them out when they are just starting to brown and are still very soft. They will continue to cook after you take them out of the oven for a few minutes. Not much beats a good chewy oatmeal cookie, I’m going to have to bookmark this one to try! Love “old favorite” recipes! thanks for the post. These look amazing! I will definitely be trying these…oatmeal chocolate chip are my favorite type of cookie.